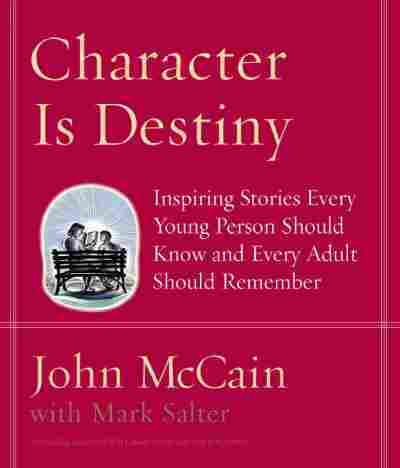 Shaping Character and Destinies: John McCain In his new book, Character Is Destiny Sen. John McCain passes along the stories of heroes — both famous and obscure — whose values exemplify the best of the human spirit. In his new book, Character Is Destiny Sen. John McCain passes along the stories of heroes -- both famous and obscure -- whose values exemplify the best of the human spirit. The book revisits the stories of Pat Tillman, a star for the NFL's Arizona Cardinals, who died as a U.S. soldier in Afghanistan; a Catholic priest in Auschwitz who offered to take a condemned man's place; and Winston Churchill, who offered simple advice: "never give up." Other historical figures range from Thomas More to Joan of Arc. Also included is the story of Mary Clarke, who left her life as a Beverly Hills socialite to work in the desperate conditions of a Mexican jail; as well as that of George Washington, lauding the leader's wisdom and ability to adapt in the face of war. I don't believe in destiny. We are not born to become one thing or another, left to follow helplessly a course that was charted for us by some unseen hand, a mysterious alignment of the stars that pulls us in a certain direction, bestowing happiness on some and misfortune on others. The only fate we cannot escape is our mortality. Even a long life is a brief experience, hard as that is to believe when we are young. God has given us that life, shown us how to use it, but left it to us to dispose of as we choose. Our character will determine how well or how poorly we choose. Your happiness is at stake in every difficult decision you must make about what kind of person you will be: honest or deceitful; responsible or unreliable; brave or cowardly; kind or cruel. Your talents have little to do with it. Your looks don't matter at all. You don't need to be good at sports. You don't need to be popular with other kids. You need not be smarter than others. Those things are nice and useful and pleasing. But they won't by themselves make you happy. Looks change. People for no good reason can sometimes treat us unfairly, and friends come and go as our lives take us to new schools, different jobs, and faraway places. Our strength and speed and agility grow for a few years, and then, for most of our lives, we get weaker, slower, and clumsier. However smart we are, there are always other people who know more than us. The stories in this book, those that are well known and those that are not, are the stories of remarkable people who chose well. Most are people of exceptionally good character. All, no doubt, had flaws. Everyone does. But they all exemplify one or more essential attributes of good character. I would be proud to be among their number. But were I to use my own character as an example of how to build yours, I would lack one of the most important qualities of good character -- honesty. My own children, who have suffered, as they often remind me, considerable embarrassment already from their father's public and unconvincing attempts at proving himself a role model for the young, have taught me just enough humility to avoid that conceit. Rather than cause them any further discomfort, I have relied instead on the example of people who have no need to prove themselves worthy of admiration. They have earned much more than public acclaim. The best I can claim for my own character is that it is still, even at this late date, a work in progress. The most important thing I have learned, from my parents, from teachers, from my faith, from many good people I have been blessed to know, and from the lives of people whose stories we have included in this book, is to want what they had, integrity, and to feel the sting of my conscience when I have chosen a course that has risked it for some selfish reason. As I am blessed with a naturally optimistic disposition, I'm still working on my character, although I am sixty-eight years old as we write this. Thus, I can profit as much as any reader from the examples of character we celebrate in the following pages. We have intended this work to be of interest not only to young readers but to parents and readers of any age. However numerous our achievements and experiences, most of us can still stand a little improvement. Even the most crowded, accomplished life can still suffer a sense of incompleteness. Our character is a lifelong project, and perhaps the older we are, and the more fixed our shortcomings are, the more we can use inspiration to encourage our escape from the restraints of our deficiencies. The greatest writer in the English language, William Shakespeare, wrote plays and poems that taught such important lessons about human nature and the qualities of good and bad people, few things written before or after have explained them better. His plays, written more than four hundred years ago, were a little hard for me to understand when I was young. But I had a teacher who loved them, and he taught me to love them. Thanks to him, those plays are for me more moving than anything we have for entertainment today. I imagine you know some of his plays and remember some of their most famous lines. "We few, we happy few, we band of brothers. For he today that sheds his blood for me shall be my brother." Those two lines are from my favorite play, Henry V. They are spoken by a king as encouragement to his soldiers who are about to fight a battle in which they are greatly outnumbered. It is a soldier's play, and I have never tired of it. One of the most often quoted passages in English literature and the theme for countless graduation speeches and self-help essays comes from Hamlet. A character named Polonius tells his son, Laertes: "This above all: to thine ownself be true, and it must follow, as the night the day, thou cannot then be false to any man." Many people remember only the first part of the line, to thine ownself be true, and they interpret it to mean we should do whatever we want to do, whatever feels good to us. But I've always interpreted it to mean we must be true to our conscience, and to do that, you cannot be false to any man. In other words, being true to our conscience, being honest with ourselves, will determine the character of our relations with others. That is a concise definition of integrity. The individuals whose stories we tell were chosen because they had a special quality, a particular strength of character that made their lives and their world better. They chose to live their lives in ways that we admire because they believed their principles were their most important possessions. Not their looks or their abilities, not their comfort or pleasure, not their job or house or car or toys or how many friends they had or how much money they made. They were true to themselves, and were not false to anyone. I hope their stories will, in some small way, help you prepare for the important choices in your own life. Not because you will face the same choices they faced. Few of us will. But they began their lives as we began ours, creatures of their appetites and entirely dependent on others, some with more advantages than you have, many with considerably fewer. We are born with one nature. We want what we want, and we want it now. But as we grow, we develop our second nature, our character. These stories are about that second nature. And if the character of these heroes, what they sacrificed for it, and what they accomplished with it, inspire you as much as they inspire me, you will find their lives to be excellent teachers. Your best teachers, of course, are your parents. From their example, even more than their instruction, you will first learn to love virtue. Their responsibility to you is much more than to feed, clothe, and house you. You are or should be the great work of their lives. Parents are not the all-knowing, ideal people we would like you to think we are. We've made wrong choices before, and will again, like everyone else. But our mistakes are not the measure of our love for you. You are that measure, and how well you are prepared to make better choices than we have made. Sometimes we forget how important we are to you, even more important than we often pretend to be, though it is rarely an intentional failure. I have sometimes forgotten it. The work I have chosen for my life has too often kept me apart from my family. Once, it kept me away for a very long time. That was not as I wished it to be, but the choice of professions was mine nonetheless. I have earned its rewards and the regrets that disturb my conscience. During my absence, I took comfort in the knowledge that their mother offered a better example to them than I did. My mother, Roberta McCain, remains a great influence in my life. She is the daughter of an Oklahoma oil wildcatter who made a fortune and retired early to devote himself to his children. She and her identical twin sister, Rowena, were renowned for their beauty, which has hardly faded over the years that have passed since heads first turned in their direction. But their personalities have always been their most attractive feature. My mother was raised to be a strong, determined woman who thoroughly enjoyed life, and always tried to make the most of her opportunities. She was encouraged to accept, graciously and with good humor, the responsibilities and sacrifices her choices have required of her. I am grateful to her for the strengths she taught me by example, even if I have not possessed them as well and as comfortably as she does. Among her greatest qualities is her endless curiosity about the world, about natural history and, even more so, human history. She is unusually well traveled and has had more adventures in her life than most people have. Yet she has never lost one bit of her interest in and enthusiasm for the work, the ideas, the passions, and the accomplishments of the world's civilizations. The joy of her life is learning about people and places, and coming to know them as well as she can; she never loses the desire to know them better. She has a remarkable capacity for delight. Life, all its adventures and many interests, thrills her as much in her late years as it did in her childhood. It is the main source of her charm, which anyone who knows her -- and many, many people claim the pleasure of her friendship -- can assure you she has in abundance. Her delight is infectious, and becomes in her company, yours. She has a great gift, and it is all the greater for the ease and happiness with which she shares it. We moved often because of my father's work. And it was my mother's job to move us, quite often very great distances. Every couple of years, she would pack our belongings, ship them ahead to our destination, crowd her three children into the car, and drive us, sometimes across the entire country, to our new home. En route, and for days on end, she would endure the nearly constant arguing and whining of my sister, brother, and me, along with the other discomforts and boredom of traveling by car. Yet she never seemed bored. And to ensure that she wasn't and that her children would not have good reason to complain (although that seldom prevented us from doing so), she would take time and considerable trouble to make sure we saw and learned interesting things along the way. She took us to dozens of famous art galleries, museums, and historical sites. Our jaws dropped in awe at the Grand Canyon, the Carlsbad Caverns, and many other natural phenomena. She once drove us hundreds of miles out of our way through Texas, and to the city of Juárez, across the Mexican border, to see a beautiful cathedral that her father had once taken her to see. After we reached the city, which was much changed since her last visit, we got lost. We looked for hours for the church that had so impressed her as a girl, but could not find it. Eventually, we found ourselves in a pretty tough neighborhood, crowded with people who did not seem to want us to enjoy our visit and gave us the impression that they thought they could make better use of our car and belongings than we could. Still, my mother persisted in her search, trying not to let the sensation of danger, which by now her children were experiencing, interfere with the enjoyment of our adventure. Eventually, as our circumstances became undeniably menacing, she abandoned our exploration, and we sped off for the relative safety of El Paso, Texas. We were disappointed, of course, but much relieved. And, after all, we had managed to see a few things we had not seen before, and to learn a lesson or two about human nature we had not known before. My mother is a stickler for courtesy and good manners. She once read a story about a time in my life when I was physically mistreated by bad men who, for a while, kept me in prison. The story quoted me calling my captors some very bad names. The words I had used were not appropriate for polite company, and I wouldn't like to hear my children use such language. But I thought my behavior, if not all that it should have been, was understandable in the awful circumstances I found myself in. My mother was less forgiving. She immediately called me to tell me she had read the article, which included vivid descriptions of the mistreatment I had suffered, and had been deeply offended by the language I had chosen to express my resentment of the abuse. "But, Mother," I argued, "They were very bad men." "That doesn't matter," she replied, "I never taught you to use that kind of language, and I have half a mind to wash your mouth out with soap." I was over sixty years old when I received this rebuke from my mother, a fact that only added to my embarrassment. And, I'm further embarrassed to admit, she has felt it necessary many times since to rebuke me for forgetting the good manners she had taught me never to discard. She always stressed the importance of humility in developing good character, a quality that, to her great regret, she worries I do not fully appreciate. As a member of Congress, and because I suffer from a hard-to-control impulse to express my views to as many listeners as I can reach, I am often on television and my name is frequently in the newspapers. Even though some people, not to mention myself, occasionally feel that I have something to say worth hearing, my mother finds the habit a little too unbecoming for people who value their dignity. She is full of aphorisms, short, wise little observations that are meant to educate the person with whom she shares them. When a reporter once asked her if she was proud to see her son become such a prominent person, she replied, "Fools' names and fools' faces are often seen in public places." This is the lesson she derives from my public appearances, which is to her far more important than whatever observation or opinion I had tried to express. She is an excellent teacher, as I have learned and relearned many times in my life. As we began this book, she was ninety-two years old, and is at this moment driving around India with her identical twin sister and best friend, Rowena, taking another look at fascinating places she has seen before, but learning, always learning something new and well worth her time. My father was an admiral in the navy, as was his father before him. He was often at sea, and absent from our home. But his children felt his influence as strongly as if he had been in our company every day of our lives. He was honest, hardworking, loyal, and one of the bravest men I've ever known. He had his flaws. Neither I nor he would ever pretend otherwise. But I don't believe he ever told a lie or refused to do his duty or acted in any way that he considered dishonorable. He had a lion's courage. In his first war, he commanded a submarine. After a long battle, and many hours beneath the sea, with little air left to breathe in the sub, he told his men they could either surrender or surface and fight, although their chances of success were very poor. They were outgunned. They were exhausted. Some of the men were delirious from the lack of oxygen in the submarine. They were all afraid, including my father. But they were good men, and they knew their skipper, my father, believed fighting was the right thing to do. So they chose to fight, every one of them. He believed dishonesty was a personal disgrace, and the very thought of being deceitful, even in small, inconsequential matters, upset him. Once, my mother jokingly accused him of cheating at cards. He shot up from the table, in great distress, and begged her never, ever to doubt or even pretend to doubt his honesty. That was an excessive and unnecessary response to what was, after all, just a little harmless teasing by his wife. She knew he was an honest man, and he knew she knew it. But it gives you an idea of how extraordinarily important his honesty was to him. He simply couldn't bear the idea of being deceitful or being accused, wrongly, of deceiving anyone. At times like that, perhaps, his virtues, as admirable as they were, made him too proud. He lived a code of honor that he had learned from his father, the man whom he admired above all others. The memory of his father, and his father's honesty and courage and sense of duty, was so important to him that he believed that he must behave at all times in ways that honored his father's name. Sometimes, I think he forgot that the only person who must believe in your integrity is yourself. That is an easy mistake to make even for people with great integrity. Many good people mistake their reputation for their character. It is a mistake I have made many, many times. Of course, our reputation should be a reflection of our character. But sometimes, through no fault of our own, it is not. And although it hurts when people think less well of us than we deserve, our integrity, our self-respect, and our happiness do not ultimately depend upon the opinion of others. They depend upon our own conscience. We must be true to ourselves. And we must be true to others, whether they believe we are or not. My father was true to himself. Whatever his faults, whatever mistakes his pride might have caused, he tried hard all his life to keep his integrity, and to accept and faithfully fulfill the demands of his conscience. He faced many difficult choices in his life. His choices were harder to make than most of ours will be. But he had the character for them. He fought in three wars, and in his last war, Vietnam, he commanded all our country's forces in the Pacific, including those who fought in Vietnam. I am his oldest son and namesake, and I fought under his command. For several years I was held as a prisoner of war in the enemy's capital, the city of Hanoi. When the president of the United States and his advisors decided to try to shorten the war by bombing Hanoi, it was my father's duty to order it done. The planes that flew to Hanoi on his orders were B-52s.They were the largest bombers in the Air Force. They could carry the largest and the most bombs. They flew at high altitudes, but unlike those aircraft used by our air force today, they did not have the technology to be very accurate in their targeting. The pilots knew Americans were being held captive near their targets. So did the man who commanded them, my father. He knew where I was, and he loved me. He prayed on his knees every day for my safe return. Whenever he visited his soldiers in Vietnam, he would end his day by walking to the northern end of the base and standing quietly alone, looking toward the place where his son was held. But his conscience required him to do his duty, and his duty required him to risk his son's life. And so he did. That is a very hard decision for a father to make. Few of us will ever have to face such a difficult choice. Even fewer of us would have the character to make the right decision. But he did. The memory of him and the example he set for me helped to form my own conscience, and shame me when I disobey it. I don't think there is anything greater a parent can do for you. Your parents, and all those who love you, are trying to the best of their ability to give that gift to you, an example of character that you cannot forget, when you follow it and when you don't. The stories in this book are intended to help reinforce the lessons they are teaching you. Some of these stories were first brought to my attention by my parents. Some I learned in school or happened upon by chance. Many of them you know. A few you won't. I hope you find some of them to be exciting stories of heroism. I hope they are all interesting to you. They might entertain you. I hope they inspire you as well. Some of them, because their heroes sacrifice so much to keep their integrity, will make you sad. That's not their purpose, but it can't be helped. Many good people have suffered for their principles. Some have died for them. But however cruel their end, they were surely comforted by the knowledge that they had made the right choice, and they had had the character to live a good life. Whether anyone knew how great their courage had been would not matter as much to them as the knowledge that they had chosen well, that their cause had been just, and their character worthy of its demands. They did not submit to an inevitable destiny. They believed their values were the power that directs our lives, and lights the world in which we burn our little candle, before our work is done and we take our rest. I don't believe in destiny. I believe in character. So I leave you with thirty-four stories of character, with the hope that they will entertain and inspire you as much as they have me. 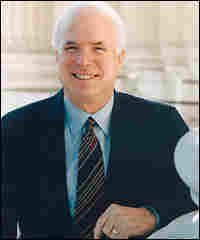 Excerpted from Character Is Destiny by John McCain with Mark Salter Copyright © 2005 by John McCain with Mark Salter. Excerpted by permission of Random House, a division of Random House, Inc. All rights reserved. No part of this excerpt may be reproduced or reprinted without permission in writing from the publisher. Rep. Bob Ney of Ohio has not resigned, as is erroneously stated in this interview. The congressman is in fact running for reelection.